I’m not one for getting dressed up to the nines, to be quite honest I never feel quite comfortable dressed in formal attire. I hope with age one day I might adjust and getting dressed up for a special occasion isn’t such a big dilemma anymore. Now I’m extremely picky when it comes to dresses- it can’t be too short, it can’t be too long, it can’t reveal too much flesh, cleavage etc. To be quite honest I’m a nightmare and I always feel so out of my comfort zone when trying to pick out a dress. Maybe it’s because I’m short and a lot of dresses are far too long on me, or maybe it’s because I’m a little a body conscious when it comes to finding something fitted. I do apologise for the brush, bobble and bag carelessly strewn across the floor of the hotel room (I’m clearly no fashion blogger). But here is me and here is my lovely dress. It was the Mr’s Christmas formal work do on Saturday night and so a suitable frock was required. 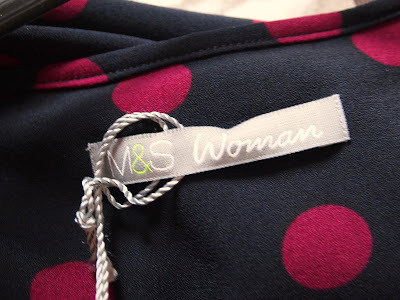 When I stumbled upon this dress on the M&S clearance rail a few weeks ago in my size, you can imagine the amount of hours I saved myself searching – Marks & Spencer you are officially my saviour. My dress only cost me eleven pounds, (down from a modest thirty-nine fifty) I was probably the cheapest dressed person there, but that didn’t really matter because I felt comfortable and happy the entire night in my choice. That dress is gorgeous, you lookm fab! Fab dress, great price and even better - you look great in it! Oh Alice you look fabulous! I know what you mean about picking out 'occasion' dresses. I am so fussy about them, hate anything low cut or too fitted. Really I'm a nightmare. All the best dresses are found when you are least expecting it, I think, and this one is lovely! Such a bargain, too! What a lovely dress you've got there!